Letaba Rest Camp is one of my favourites. It is supremely positioned on the banks of this great perennial river and it’s quite possible to watch game all day long from the comfort of a chair just outside the restaurant if that’s what suits you and sometimes in the real heat of summer maybe this is a good idea. Letaba is the first camp to carry out experiments with Bat houses. The camp erected its first 2 Bat houses just outside the famous Elephant Hall in 2004. The idea was to find an ecologically acceptable way to keep bats out of guest bungalows since bats over time found some of these accommodation points perfect roosting places ( I once had one in the bungalow I was staying in … I caught the bat in a towel and let it go outside although it probably returned later). There are now 12 Bat houses (2006) around the camp and these are monitored daily … there is an informative poster at the camp. Today was an extremely long drive since it included 2 cul-de-sac routes around 20 kms long each. One was to the Giriyondo Border post (named after the hill close by) on the newly completed road and the other was also along a newish road heading south west from Mopani camp to Stapelkop Dam. 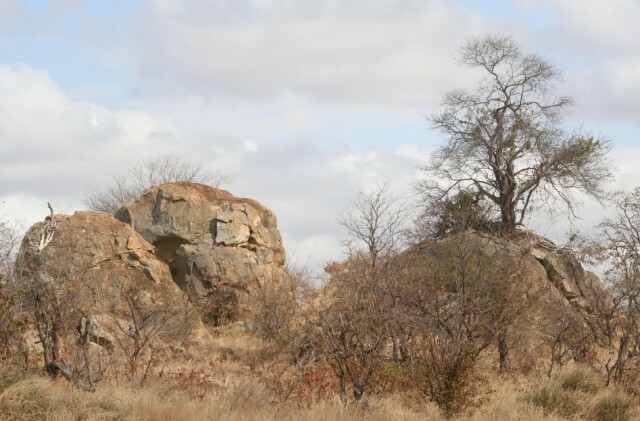 Stapelkop (stacked hill in Afrikaans) refers to the way koppies or hills in the area are stacked on top of each other as if they had been placed there by a giant bricklayer. 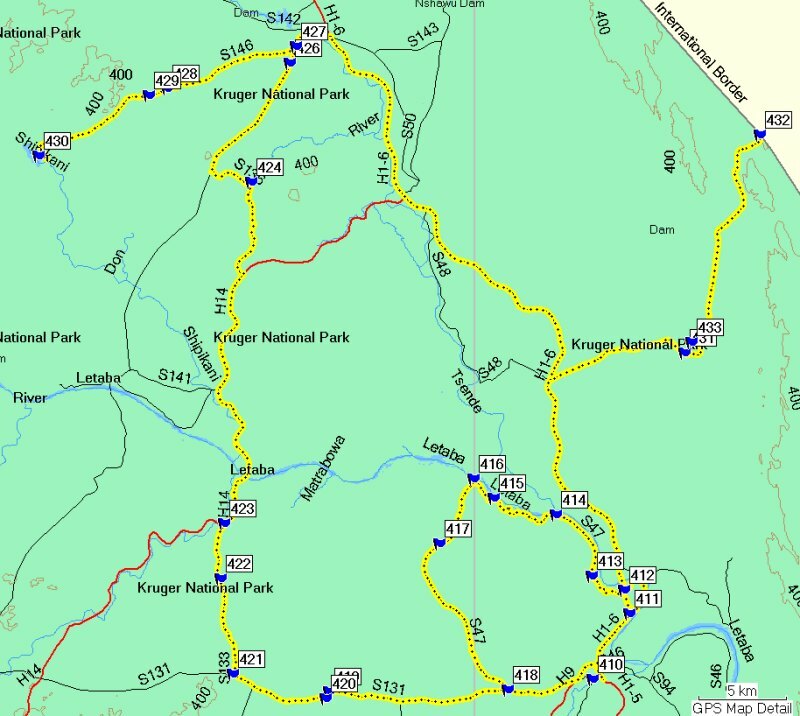 The map below shows the total day’s coverage but the description has been split into 2 pages and this first page will cover the loop road close to Letaba Camp with the designated road name of S47 or the Mingerhout Loop. Mingerhout is the Afrikaans name for the Matumi Tree. The more detailed 2 km scale map is shown here. 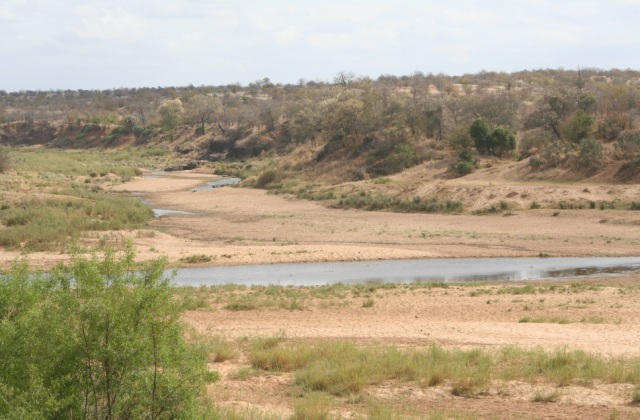 For about 14 kms the road follows the upstream course of the Letaba River and is a beautiful and peaceful and scenic drive. Before reaching the loop turnoff at waypoint 412 there was another small loop road, the S95 of about 2kms in length to be completed, marked by waypoint 411. This short loop also ran parallel to the Letaba River offering great views of a range of animals including Hippos on the sand banks, Impala, Waterbuck and Elephants. I was however surprised that I did not see more water birds such as herons, storks and the like although earlier I’d seen many Egyptian Geese in the river shallows. Before we were able to take the loop road we sat in a traffic jam (well not quite) caused by a family of Elephants who were quite determined to occupy this prime space of land by one after the other of the group taking a holding position on the tar road making it unwise for cars to try to pass. I enjoyed sitting there for 25 minutes watching the slow build up of traffic all wanting to pass the pachyderms. 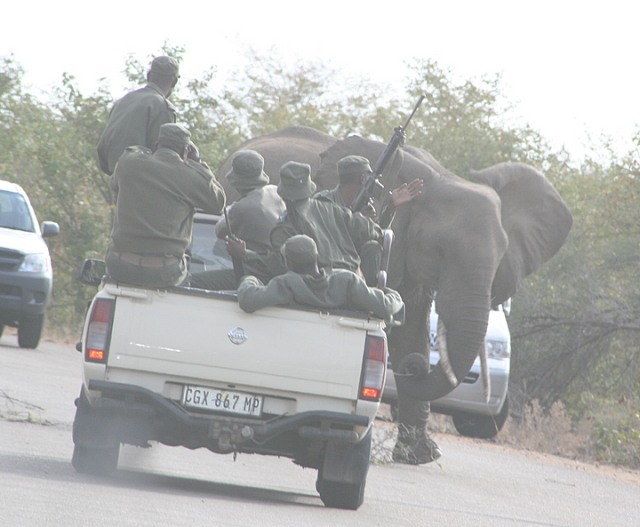 A bakkie (pick-up truck) then came along with a group of rangers in it and they also stopped for a while then seemed to lose patience and approached the Elephants slowly. The one blocking passage, toying with a branch in the middle of the road, was still not willing to move so the driver started to rev the engine as he got closer. This gave the animal a scare and off he went. We all followed the bakkie to make our own separate ways. I do not suggest that you try similar tactics in a similar situation … rather wait, be patient stay at a comfortable distance form the animals and they will move off sooner or later. 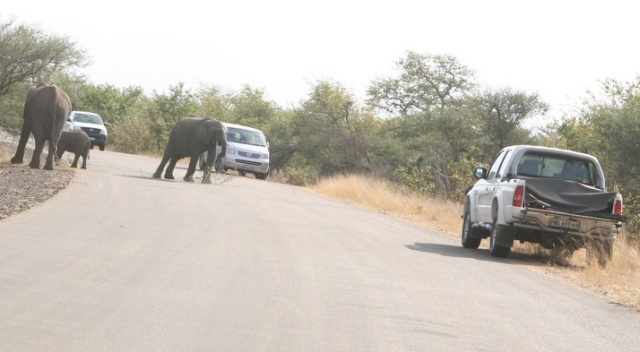 Later in the day I would sit in another Elephant road block after crossing the Letaba River on my way north. 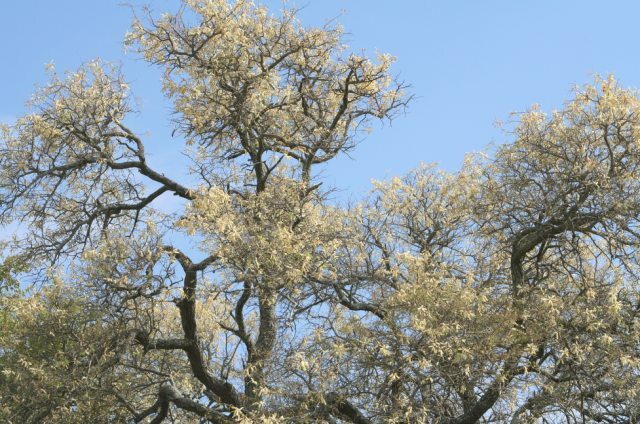 The Knobthorn Trees were in full blossom in most parts of the Kruger and they made an impressive sight. It was at least one of those occasions that it was possible to pick out the common Acacia Nigrescens from all the other species of trees … not so easy from a distance when there are no blossoms to be seen. The tree gets its name from the fact that it is a veritable mass of thorns that occur across the whole tree structure trunk and all … the trunk thorns are like small knobs with a spike on the end. Just in case you are chased by an Elephant or Rhino in future try to avoid picking the Knobthorn tree as the one to climb in a hurry. The Mingerhout Loop is about 36 kms in total. 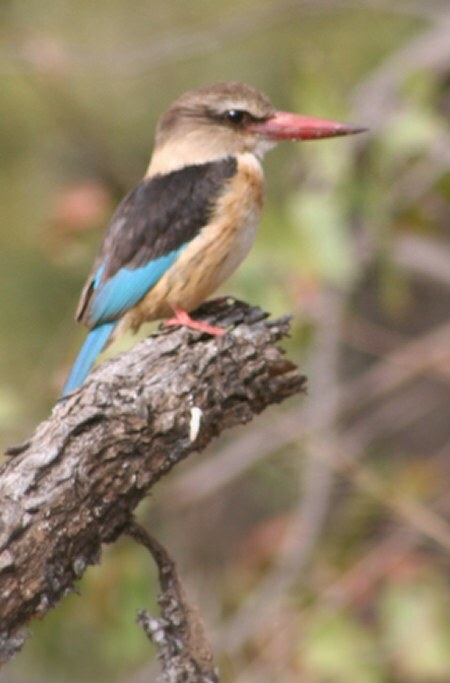 The views of the Letaba are quite spectacular with something to be seen at almost every turn or twist in the road. Waypoint 413 was the crossing of the N’Wanetsi dry river bed. There were lots of view points and small lay-bys. 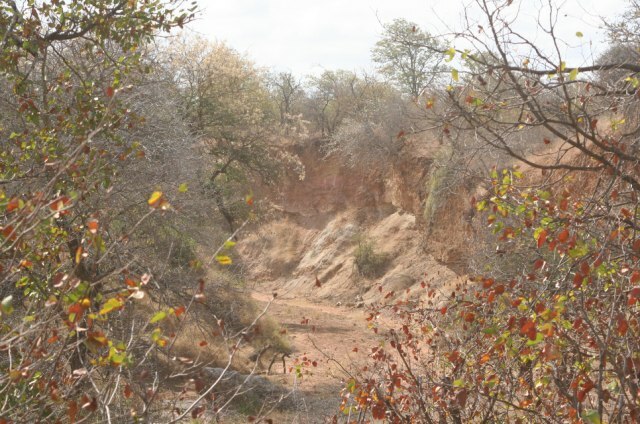 A few weeks earlier in August my family and I had driven the Tsendze River loop and now passed the confluence of the Tsendze with the Letaba as shown in the picture at waypoint 414. The banks are very steep as can be seen on the right hand side especially. The area was characterised by thorn trees including the Umbrella Thorn. A large gaggle of Geese (Egyptian) were relaxing on the banks of the Letaba just downstream of the confluence. The Tsendze was not flowing but did contain a series of pools as was typical for the late winter months. A large herd of Elephants was upstream of the confluence. Shortly after this stop I pulled into a way-by and stopped the engine. Thee was absolute silence and I mean no noise at all, nothing. How wonderful was this feeling … it lasted for a couple of minutes only to be broken by the call of a distant Cuckoo. 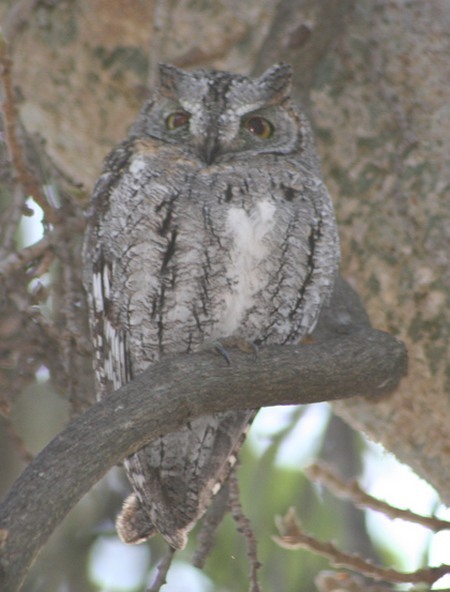 Oops almost forgot to tell you … I saw an African Scops Owl at the Letaba Camp close to the restaurant. It was calling out “prrup” very regularly. It was sitting very close to the main branch and blended in perfectly. It obviously roosts in the same spot … it was there the next day too. Some 4 kms from the confluence and out of nowhere appeared a magnificent round rock structure. What was really interesting was to see a comparatively large tree growing out of what appeared to be solid rock. Take a look at the photograph and marvel at how well nature gets it colours right. Not a single mismatch in the whole scene. A couple of kilometres later at waypoint 416 was the concrete spillway of the Mingerhout Dam with an nice open lookout point. There was a large herd of waterbuck downstream and they were close to another herd of Impala. Just upstream was a small sandy island and it was “packed” with crocodiles. I thought of Steve Irwin, The Crocodile Hunter, and how he would have a field-day here and it was the next day I think that I heard he’d been killed by a Stingray barb piercing his chest while diving on the Great barrier Reef. At waypoint 417 I crossed the N’wanetsi … take a look at the very steep banks of the river and imagine the power of the flow when this river comes down in flood. Just to the right was a ridge of what was probably sandstone rock outcrops. They rose some 20 to 30 metres above the level of the road. From hereon until waypoint 418 which marked the junction with the S131 the drive was quite uneventful.